This year's Pro Bowl was a very competitive game, with Team Rice defeating Team Sanders 22-21. However, a score on the final play wasn't counted, one that had a direct impact on the outcome of the game against the spread, screwing over the majority of bettors in the process. Team Rice was a 1.5 point favorite heading into the game, with 60% of bettors on Team Rice according to SportsInsights. After a Team Rice touchdown (from Alex Smith) and two point conversion put them up 22-21, Team Sanders attempted a 67 yard Justin Tucker field goal to win the game. The attempt was well short, and was returned for a touchdown by Antonio Cromartie after everyone had stopped trying to tackle him. He was never tackled or taken out of bounds, but the score was not counted in the final score. 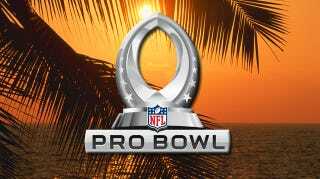 Now, I wouldn't bet on the Pro Bowl myself, but with the majority of the money on the team that had points taken away from them at the end of the game, there are probably a lot of people upset about the ending.